The Founder of the Monoposto Racing Club, Frank Tiedeman, passed away in 2013. A new Autumn Championship was established that year bearing his name. 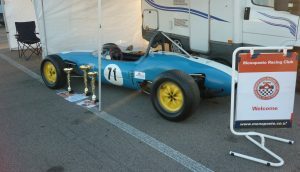 Frank was a prominent advocate of low cost single seater racing, which is the objective of the Tiedeman Trophy, offering cost effective racing at the end of the season. The Trophy was trialled in 2013 as a four race mini-series at two circuits with great success and has grown into a 6 race, 3 meeting championship. In 2017 we gained a new title sponsor, Reprise IT, who will be going into their third year of sponsorship in 2019. 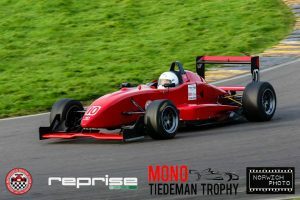 Cars complying with any class in the 2019 Monoposto Championship Regulations, plus an Invitation Class for Single Seater Racing Cars up to 2000cc, at the discretion of the Monoposto Racing Club. Each meeting is held on one day, with one qualifying session and two races. All classes share one grid. Points will be awarded in each class to Competitors as follows: 1st = 15, 2nd = 12, 3rd = 10, 4th = 9, 5th = 8, 6th = 7, 7th = 6, 8th = 5, 9th = 4, 10th = 3, 11th = 2 points. Every other place = 1 point. Plus Fastest lap in each Class = 1 point. Plus 1 point for each of the number of entrants in the class who qualify for the round. Cars in the Invitational class do not score points. Therefore, the Champion could come from any Mono class and the championship rewards consistency throughout all the rounds. At each round, trophies are awarded for 1st, 2nd and 3rd in each race. Plus the Champion of the Circuit 1st, 2nd and 3rd places which is worked out according to the scoring formula above across the two rounds at that track.